I have a confession. I have a VERY hard time remembering to drink enough water. As a dentist, my days get so busy and all of a sudden, I realize I haven’t been drinking as much water as I should. 😬 I do try to mix it up with some water alternatives like sparkling water (Bubly is my favorite brand) and tea. 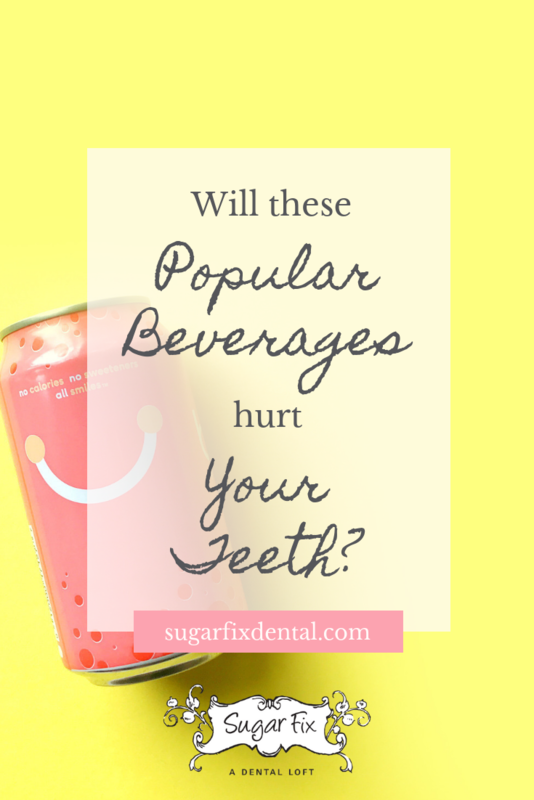 But do these popular beverages hurt your teeth or is it just good to stay hydrated? Most people think dentists are opposed to red wine because of it can tend to stain the teeth. However, would you believe that we actually prefer you drink red wine over white wine? It’s true! White wine is more acidic than red, so it can wear down the enamel faster. When this happens, teeth get discolored more quickly. So, white wine can actually lead to staining faster. Crazy, right? Here’s another beverage you probably think you know where dentists stand on, but again, you might be mistaken. According to one study, coffee drinking was linked to a decrease in cavities! We’re not totally sure why, but a group of people who only drank coffee (with no cream or sugar added) had fewer cavities at the end of the study than those who drank other kinds of beverages. No, we’re not going to tell you that soda is safe for your teeth. Soda and sparkling water are both acidic and can harm your enamel. Surprisingly, there is no difference at all between low-sugar diet sodas and regular sodas. They’re all pretty bad for your teeth. Sparkling water is a better choice, but we encourage you to drink through a straw if possible! One more fun fact: studies have shown that root beer is not that bad for your teeth. So, if you have to have a soda, make it a root beer! Interestingly, the most common way alcoholic beverages hurt your teeth actually has nothing to do with the actual alcohol content. It’s everything that goes along with it. A lot of people mix liquor with soda, which can cause staining. Alcohol can cause dry mouth. Our saliva helps to remove plaque and bacteria, so it’s important to drink water while consuming alcohol. Lastly, many people have a bad habit of chewing ice while they’re drinking, which can lead to cracked or broken teeth. Yikes! If you choose to consume these beverages, be sure to swish with water afterward. If you can, it’s always a great idea to brush your teeth, but wait about 30 minutes to do so. Brushing teeth that have a weakened enamel due to acidic or sugary beverages can actually be more harmful than not brushing. Waiting a bit will give your saliva a chance to do its job first. If you have questions about how to keep your teeth looking and feeling great, we’re just a phone call away. We’d also love to help you set up an appointment for your next cleaning or dental service. You can reach us at 773-883-1818!